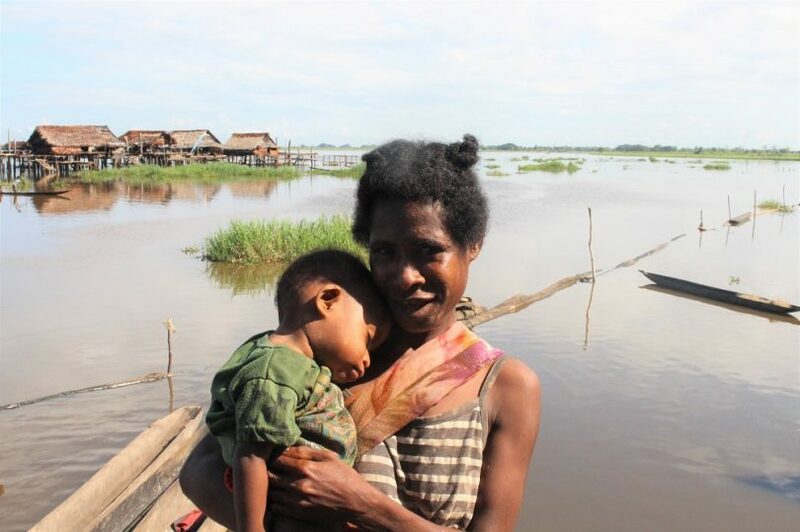 Papua New Guinea (PNG) is facing a nutrition crisis. 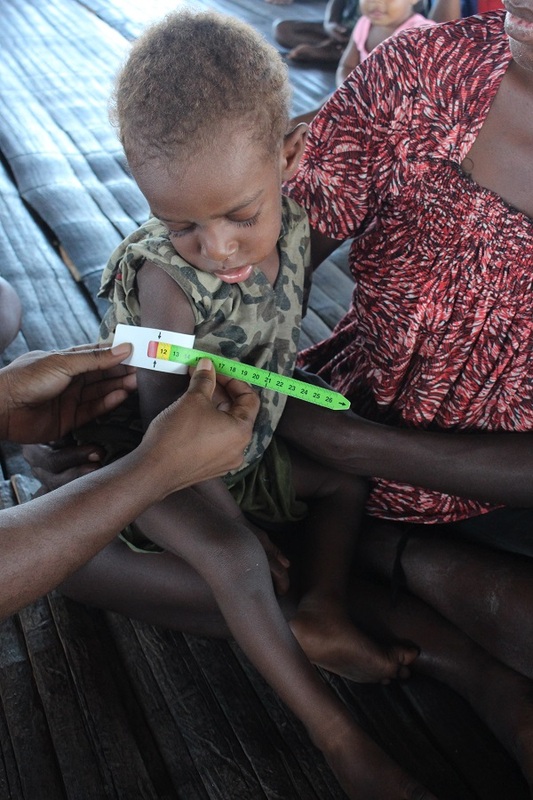 Alarmingly, almost one in two children in PNG have stunted growth from chronic malnutrition. [i] PNG has the fourth highest child stunting rate in the world – a rate that is more than double the global average. Not only does malnutrition pose a threat to the survival and development of children in PNG, it also poses a major threat to sustainable economic growth. Evidence shows that if a child is malnourished during the first 1000-day period from conception to their second birthday, they will suffer cognitive and physical impairments that are permanent and irreversible. These impairments limit a child’s education and employment prospects. Reduced individual earnings translate into reduced economic productivity at the national level. This is how malnutrition can trap children in an intergenerational cycle of poverty. Not only does undernutrition rob children of their growth and earning potential, it also threatens their very survival. According to national data in PNG, approximately 33% of all hospital deaths of children under five are either directly or indirectly caused by malnutrition. However, in a new report commissioned by Save the Children, Frontier Economics estimates that malnutrition could be the underlying cause of up to 76% of total deaths of children under five across community and health facilities combined[ii] – a figure significantly higher than the global estimate of deaths of children under five associated with malnutrition at 45%. Evidence also suggests that childhood undernutrition can increase mortality risks later in life, with stunted children more susceptible to obesity, coronary heart disease and type 2 diabetes. These losses significantly exceed PNG’s projected health and education sector budgets for 2017 – $USD385 million and $USD366 million respectively. However, the estimated cost of $USD508 million is regarded as conservative, and Frontier Economics posits that the economic cost of child undernutrition could be as high as $USD1.5 billion per annum – 8.45% of GDP – using alternative assumptions. Despite the enormous toll of child undernutrition on PNG’s economy, little progress has been made in tackling this challenge over the past two decades. Indeed, the child stunting rate appears to have worsened from 43.5% in 2005 to 49.5% in 2015. 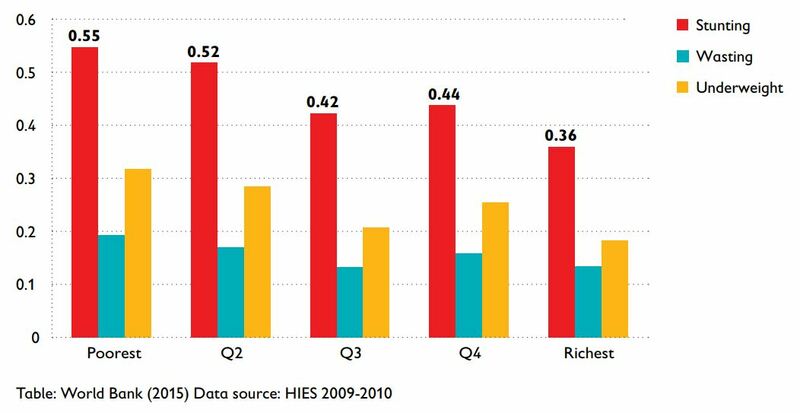 Interestingly, the stunting rate is high across all wealth quintiles. As shown in the figure below, the poorest wealth quintile has the highest stunting rate at 55%. However, the stunting rate among the richest quintile is still very high at 36%, and similarly high among the third and fourth quintiles. This begs the question, why? Despite overwhelming evidence of the efficacy and cost-effectiveness of such interventions, they have not been prioritised by PNG’s largest multilateral and bilateral donors to date. For example, Australia is PNG’s largest bilateral donor, but its investment in nutrition has been extremely limited. According to a review conducted for Australia’s Office of Development Effectiveness, only 0.1% of Australia’s official development assistance to PNG was allocated to nutrition in the years 2010 and 2012 (latest available data). Also, there is a tendency to focus on agricultural interventions, which do not tackle the underlying reasons why there are such high child undernutrition rates. Australia’s aid to PNG is intended to promote human and economic development. However, it is questionable whether Australia’s aid investments will achieve this purpose in the longer term if around half of the country’s population of working age continues to suffer cognitive and physical impairments from childhood undernutrition. The Government of Papua New Guinea is taking positive steps to improve child nutrition with the revision of its National Nutrition Policy. However, it cannot tackle a challenge of this scale alone. There is an urgent need for donors, such as Australia, to reallocate technical and financial assistance to support targeted interventions to improve child nutrition. Otherwise, malnutrition will continue to undermine the great human and economic potential of our closest neighbour. Majella Hurney is Head of Policy & Advocacy at Save the Children Australia and author of the report Short Changed: The Human and Economic Cost of Child Undernutrition in Papua New Guinea. [ii] Frontier Economics estimates that 4,174 girls and 5,200 boys will die prematurely as a result of childhood undernutrition. These deaths account for the majority of deaths for girls and boys under 5 years, representing 76% of the total child mortality in the country. Majella Hurney is the Head of Policy & Advocacy at Save the Children Australia (SCA). She leads the organisation’s research and policy initiatives on humanitarian affairs and international development, as well social and economic issues in Australia. She holds a Masters of International Law from the University of Cambridge, England, and a Bachelor of Laws/Business (Hons). Eleven years later, legendary colonial official Dr John Gunther, formerly Director of the Department of Public Health and now Assistant Administrator pointed out that even after all the efforts at post-war reconstruction: `The population is not healthy: the expectation of life is half of what it should be; the infant mortality rate twice to ten times what it should be…These indigenous people of the Territory are only 80 per cent well…This [is] the physical condition of the people which has to be improved so that their country may progress, for they are the only labour force available to achieve development’. (Source for quotes: see my Securing Village Life Canberra: ANU E-Press, 2013, pp.48-53 ). Perhaps something else is required than targeted interventions. Maybe the `crisis’ isn’t all that new and is largely a continuity?